Marie Angeletti, Cornelia Baltes, Joshua Bilton, Sarah Brown, Savinder Bual, David Buckley, Leah Capaldi, Alicja Dobrucka, Tomas Downes, Peles Empire, Katie Goodwin, Kate Groobey, Noel Hensey, Anna Ilsley, Kim Kielhofner, Minae Kim, Se-jin Kim, Sui Kim, Ute Klein, Hyewon Kwon, Ian Marshall, Georgina McNamara, Sophie Neury, Rasmus Nilausen, Nick Nowicki, Marco Palmieri, Selma Parlour, George Petrou, Yelena Popova, Jessica Sarah Rinland, Anne Kathrin Schuhmann, Dagmar Schurrer, Alison Stolwood, Jonathan Trayte, David Ben White, Samuel Williams, Lisa Wilkens, Poppy Whatmore, Hyun Woo Lee, Rafal Zawistowski. Raven Row will present the work of Asier Mendizabal in his largest exhibition outside Spain to date. Mendizabal researches the symbols through which cultures are represented. He is especially interested in oppositional and sub-cultures, which are often defined by their adherence to such symbols. Mendizabal unpicks and re-imagines these, questioning the relation of cultural identity to cultural representation, and generating new forms of abstraction. Working with a variety of media, this exhibition will include photography, graphics and photomontages, but its strongest register will be with abstract sculpture. 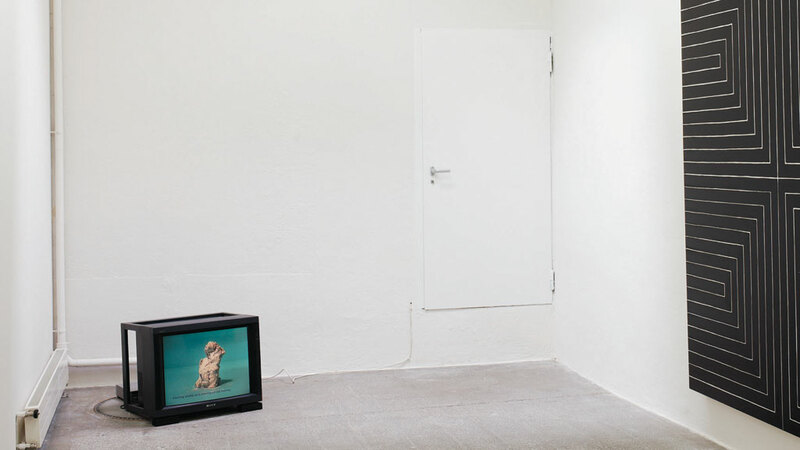 Image: Asier Mendizabal, Untitled (Targu Jiu), 2010. Installation view at Museo Nacional Centro de Arte Reina Sofía, Madrid. Photo: Joaquín Cortés/Román Lores, courtesy Carreras Múgica Gallery, Bilbao. American artist Dara Birnbaum was one of the first to subvert the language of television and is internationally recognised for her pioneering video works made over the past three and a half decades. For her South London Gallery exhibition she presents the UK premiere of her recent work, Arabesque, 2011, a multi-channel video installation which reflects on the legacy of two compositions; one composed by Robert Schumann for his wife Clara, the other composed by Clara Schumann for her husband Robert. Spanning the SLG’s main exhibition space and first floor galleries, the show also includes the seminal work, Attack Piece, 1975, Birnbaum’s first surviving installation, and a series of her earliest single channel video works from the 1970s. The artist Tom Varley has been selected as the recipient of the Drawing Room’s first Bursary Award. 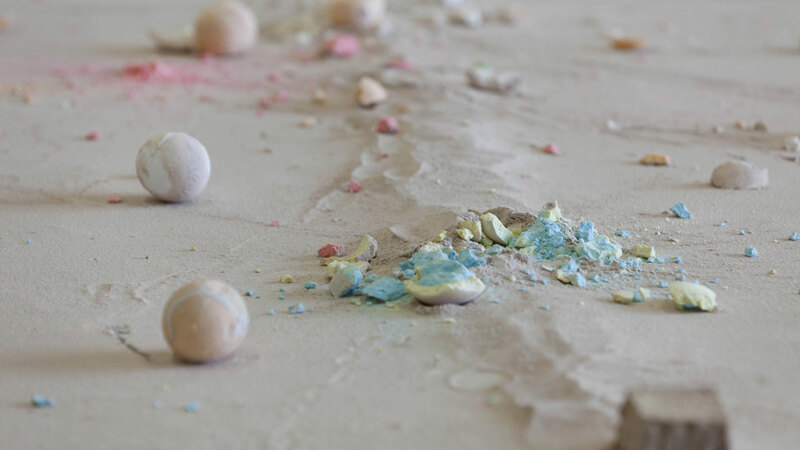 The Bursary Award reflects Drawing Room’s commitment to supporting the production of new work and the development of artists’ practice at significant stages in their career. Varley has chosen to use the gallery as a studio and will be resident at the Drawing Room for one month in January – February 2012. Rather than aiming to produce a finished and substantive body of work suitable for public exhibition, the artist intends to set himself daily tasks which will encourage risk-taking and experimentation. Creating a blog and video feed as a tool for the development of his own practice, he will make his artistic processes accessible to a wide audience, alongside conducting workshops and initiating discourse with fellow practitioners. Public events include open studio sessions and a talk by the artist. Image: Tom Varley,Three Figures (Detail), 2009. Clay, Wood, Glass, Polythene, Gloss. Courtesy the artist. Chisenhale Gallery presents a solo exhibition by Christina Mackie, comprising a number of new works across sculpture, video, photography and drawing. Mackie has titled the exhibition Painting the Weights, a term used to label the process of establishing the physical make-up of an object within the field of digital animation. For her exhibition at Chisenhale, Mackie will use the interface between scientific arguments and their virtual illustration as a way of inhabiting a number of artistic strategies. An investigation of the dislocated technologies of human interaction provides a linking theme. The framing and composition of Mackie’s works in Painting the Weights are carefully controlled to create a dense but playful set of relations between the individual artworks and the gallery space itself. Painting the Weights consistently returns to a discussion of connectivity – of the connection between societal structures and geology, the dislocation of the body to its material context and also the forces of representation that determine our understanding of the material world. Barnaby Barford, the artist who creates unique ceramic narrative pieces reflecting today’s society, has been commissioned to produce a series of sculptures at the Laing Art Gallery. The Big Win: A Modern Morality Tale will tell the story of a ‘layabout’ striving to live a celebrity lifestyle who wins the lottery. 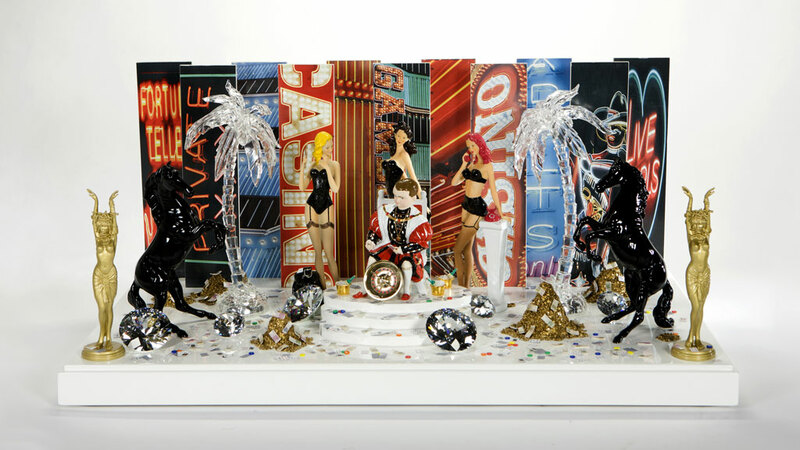 Charting his rise and fall as his money runs out, the sculptures will explore our insatiable appetite for celebrity culture and living beyond our means. Loosely based on the narrative of A Rake’s Progress by 18th century artist William Hogarth as well as the themes inherent within the Laing’s 18th and 19th Century Permanent Collection, Barnaby Barford’s The Big Win also depicts contemporary society’s problems and experiences such as gambling and luxurious living. Image: Barnaby Barford, The Big Win No.4, 2011. © Barnaby Barford. Photo by Dan Prince. You, Me, Something Else is an exhibition about sculpture from Glasgow that presents exciting examples of current practice in the city by focusing on ten artists who are all at different stages of international careers. Glasgow is renowned for the artists that live and work here, and many of them use the medium of sculpture. The works on display in this exhibition demonstrate how contemporary artists can question established assumptions about what a sculpture can be, what it is made of and how it should look and be displayed. Image: James McLardy, Strive to Set the Crooked Straight, 2009. Walnut veneer, printed textile. Photograph © Neil Smallbone. This exhibition brings together three artists who each use an abstract, allusive vocabulary of object-making to investigate the way we create meaning through form. Their chosen media and techniques are very different, though in each case familiar materials are made unsettlingly strange. 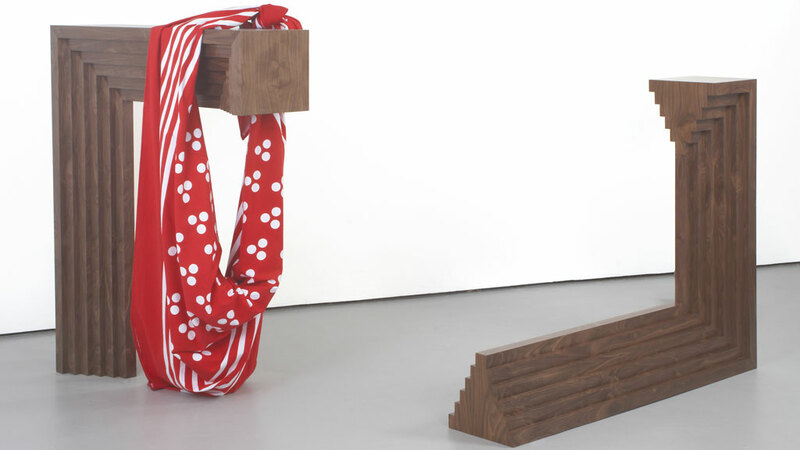 Unlikely sculptural materials such as cosmetics, sugar paper, blackboard paint and brass hinges, or craft in the form of turned wood and tapestry, are co-opted by all three artists to diverse and distinctive effect. From elements that are sometimes meagre or over-familiar, new forms are created that are authentically mysterious and highly evocative. An Arts Council Collection exhibition curated by Katrina Brown and Caroline Douglas. Image: Karla Black, Persuader Face, 2011. Installation detail, Longside Gallery, March 2011. Arts Council Collection, Southbank Centre, London © the artist. Courtesy Galerie Gisela Capitain, Cologne. Taking an interest in ceramics in contemporary art as a starting point, the group show Slipped presents the work of 11 artists who bring a criticality to the history and materiality of ceramics. Although many of the works on show begin with an interest in the material of clay and its properties, the artists presented explore ceramics from within their broader practice as sculptors, painters, performance and video artists. The approach that the artists in Slipped have taken to clay as an extension of their painting or sculptural practices has resulted in an exciting and innovative works that combine the visual and sumptuous nature of ceramics with a conceptual rigour. Tate St Ives presents the first major exhibition in the UK of the work of Simon Fujiwara (b.1982), a young British/Japanese artist who has been building a strong reputation over the last few years with a string of acclaimed projects around the world. Fujiwara moved to Carbis Bay, a mile from St Ives, when he was four years old, living there with his mother until he was sixteen. 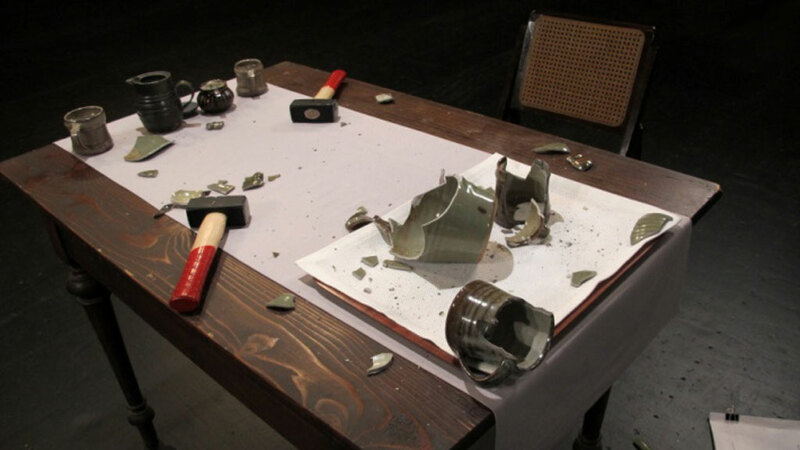 Much of Fujiwara’s work is deeply autobiographical, mixing fact and fiction to create intricate installations and performances which draw on his family history. Through novels, theatre plays, lectures and installations, he scripts and performs his biography as fiction – an ongoing drama in which he plays the roles of artist, novelist, anthropologist, eroticist, architect and playwright, fusing the personal with universal socio-political and historical themes. The show at Tate St Ives presents five commissioned works and two of Fujiwara’s major works completed over the last three years, creating a series of ‘rooms’ which he has described as resembling ‘a walk through the stage-set interiors of a National Trust mansion’. Most of the new works are based on his childhood in Cornwall, his relationship with his absent Japanese father, and his formative encounters with art and artists in the town. In this way the show brings his projects together in the unique context to which they refer. In addition, Fujiwara integrates key works from the Tate collection into the exhibition – including paintings by Francis Bacon, Patrick Heron and Alfred Wallis and sculptures by Barbara Hepworth – in an innovative display that mixes them with his own works. Image: Simon Fujiwara, Rehearsal for a Reunion (with the Father of Pottery), 2011.HD video, colour, sound. 14 min 25 sec. Courtesy the artist. 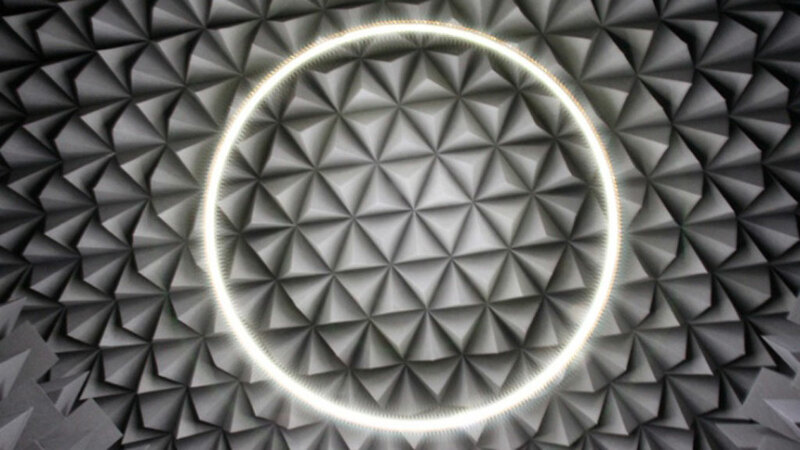 Haroon Mirza merges techniques, approaches, methodologies and materials from both art and design cultures. 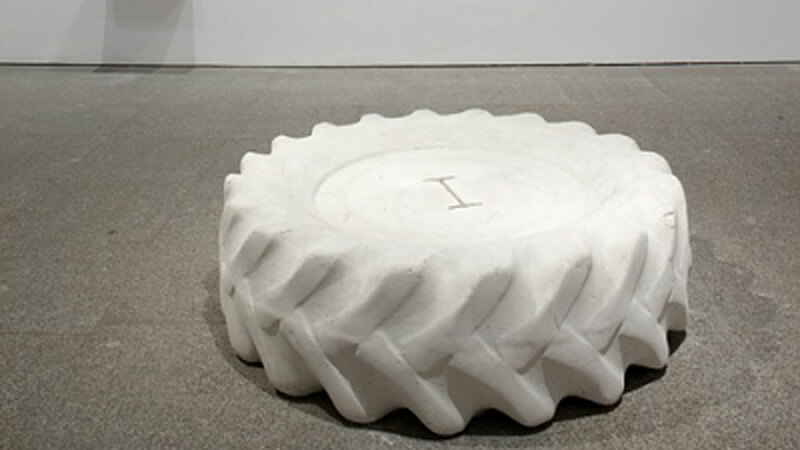 Winner of the 2011 Silver Lion Award for ‘Most Promising Young Artist’ at the Venice Biennale, his assemblages combine objects such as furniture and household electronics with video footage and works by other artists to form hybrid acoustic systems that also operate sculpturally. At Spike Island Mirza presents a new body of work in his largest exhibition to date, organised in collaboration with Camden Arts Centre and mima.